Learning wheelchair tennis with the Pros video tutorial. The tutorial covers all areas of the wheelchair game, such as basic strokes and mobility, advanced strokes and mobility, mental toughness, wheelchair selection and injury prevention. Let’s Roll – Learning Wheelchair Tennis with the Pros is available free at www.wheelchair-tennis.com and www.letsrollwheelchairtennis.com. It can also be loaded into your smart phone with a web application, while a native app for Let’s Roll is also on the way. 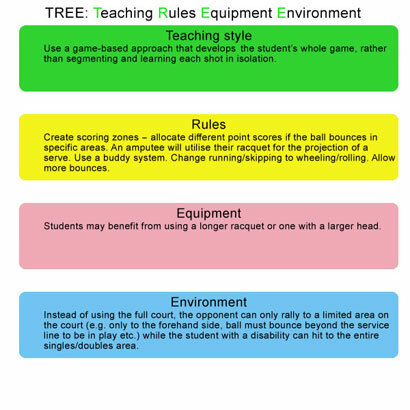 TREE (Teaching Rules Equipment Environment) is an instant way of remembering how to modify the activity for players with a physical disability.